Meanwhile, 4,500 miles to the west of those Cheltenham pylons, a Wyoming maths teacher called Karen Stephens was getting to grips with her own copy of the book. The American edition carried a note on its back cover inviting readers to send their solutions to Cape by post and promising them a free plane ticket to the UK if they got it right. Williams was sent on a publicity tour of the US chat shows, where his performance as a British eccentric stirred up a lot of interest. The enterprising airline boss Freddie Laker followed this up by offering special Masquerade flights to the UK, with a free spade awaiting every traveller when they arrived at Heathrow. Armed with this idea, Stephens found herself thinking of the Greenwich Meridian. This is the Earth's line of 0 degrees longitude, which is used as a global standard for navigation and time-keeping. About 235 miles of this meridian passes directly through England, and what could be more natural than for Williams to bury his hare at some point along such a significant line? Stephens studied the numbers mentioned in Masquerade's story and paintings, and used these to select precise points of latitude along England's stretch of the meridian line. That produced a lot of different possibilities, and Stephens had no idea which was correct, so she simply flooded Williams with letters, each one containing a slightly different answer. Sooner or later, she hoped, the sheer volume of her correspondence would let her hit on the right location. That was an approach which had served her well in an earlier Games Magazine competition, where she had netted $1,000 by sending the organisers many copies of the single correct answer. When the magazine made its random draw from all the correct answers received, Stephens had many more chances than her rivals of being the one selected, and so won the prize. Unfortunately, the same approach did not work with Masquerade. Using degrees, minutes and seconds for her latitude readings - as Stephens did - she would have needed just over 13,000 guesses to cover every possible point along England's stretch of the meridian line, and sending that many letters was never going to be possible. Many other equally colourful Masqueraders are profiled in Gascoigne's book. 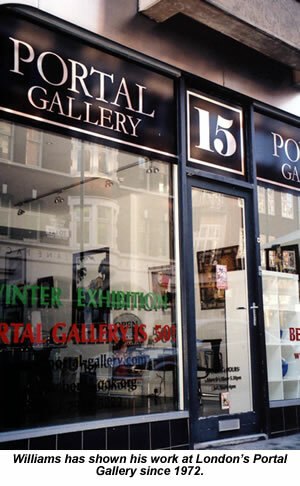 There's Tony Gibson and Peter Marskell, who called the Portal Gallery posing as rich US art collectors; Edward Jenkins, recruited at seven as a frontman for his parents' theories; Michael Savill who decided the windows in one painting represented punch-card instructions for a weaving machine. Perhaps the strangest of all was the American Gascoigne christens “Richard Dale”, whose story we'll come to later. Williams became accustomed to hearing from oddballs like these, and used their exploits as fodder for his regular TV appearances. Interviewed by Desmond Morris for a BBC arts show in February 1980, he recalled an incident from the previous November. Williams was getting as many as 200 letters a day at the height of Masquerade fever, the longest of which would cover seven pages of this site. With personal callers to deal with as well as the 30,000 letters the book eventually produced, Williams relied on his village neighbours to keep the worst intruders at bay. years earlier with I Lost My Heart to a Starship Trooper. Sinitta would have to wait until 1986 for her own first hit - So Macho - but it was clear the cast didn't lack star power. The crew was equally distinguished, led by Tony-winning choreographer Arlene Phillips.